Cornbread makes a perfect backdrop for blueberries, which burst as they bake, creating little pockets of juice that keep the muffins tender. You can’t help but love these little muffins. The slight crunch and savory flavor of the cornmeal make a perfect foil for the blueberries, which burst as they bake, creating pockets of juice that keep the muffins tender. Plus, they’re so simple to make: with just a few bowls and a whisk, you can whip them up in 15 minutes, and enjoy them warm out of the oven with your coffee 30 minutes later. Meanwhile, combine the flour, cornmeal, sugar, baking powder and salt and in a large bowl. I like to place the ingredients in the bowl neatly, so I can see what I’ve already added — otherwise, I’m likely to forget. To keep the berries from sinking to the bottom of the muffins, toss them with 1 teaspoon of the flour mixture. Set aside. 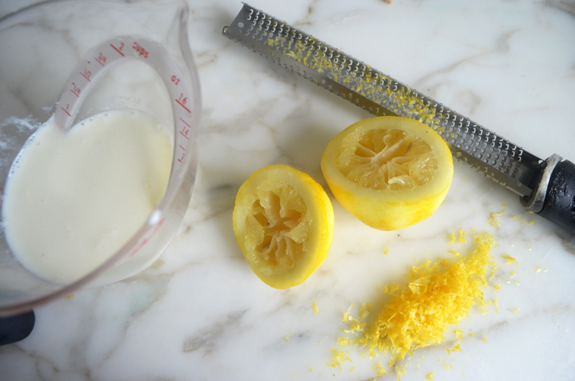 In another bowl, whisk together the milk and lemon mixture with the eggs, vanilla and lemon zest. Add the liquid mixture to the dry ingredients, along with the melted butter. Stir until just blended. Add the flour dusted blueberries. Spoon the batter into a muffin pan lined with paper liners. They will be very full. Bake for about 30 minutes, until set and lightly golden. Let the muffins cool for a few minutes in the pan, then turn out onto a rack. Preheat the oven to 350°F degrees. Line a muffin pan with paper liners (don't skip the liners or the blueberries will stick to the pan). Combine the milk and lemon juice. Let sit for 10 minutes. In a large bowl, whisk together the flour, cornmeal, sugar, baking powder, and salt. Place the blueberries in a small bowl and toss with 1 teaspoon of the flour mixture. Set aside. In a separate bowl, whisk together the eggs, milk/lemon mixture, vanilla and lemon zest. Add to the dry ingredients, along with the melted butter. Stir until just blended; and then stir in the blueberries. Do not overmix. Spoon the batter evenly into the prepared muffin pan, filling each cup very full. Bake for 28 to 30 minutes, or until the tops are set and golden around the edges. Cool the muffins for a few minutes in the pan, then serve warm with butter or transfer to a wire rack to cool completely. Notes:Be sure to zest the lemon before juicing it. Don't be tempted to increase the blueberries: one cup is just the right amount -- if you jam-pack the muffins with berries, they'll be too tart and wet. These muffins are fantastic! I have tried making them with and without lemon, and both times they were delicious! Thank you! These are excellent. I left out the lemon zest as I was serving with lentil stew and wanted the corn and blueberry flavor to come through. I used frozen wild blueberries as I read somewhere they have more flavor, as having more flavorful skin, less flavorless pulp. I think it’s interesting that the muffins don’t need baking soda. I doublechecked to make sure I hadn’t missed it when I copied out the recipe, but it’s not there and they rise just fine without it. I also appreciate the caution not to overstuff the muffins with blueberries. I probably would have done that. Wayyyyy too much sugar asked for in the recipe, something I find all too common in muffins, especially those with fruit. This being a corn muffin, I prefer to taste the corn and the blueberries, so strongly recommend folks cut the crazy amount of sugar (in half or more) asked for in muffin recipes as a whole – for this it allows you to really get both the savory of the corn and natural sweetness of the blueberries (which, when I made these, increased to 3/4 cup blueberries as I love them! )…and it’s great! BTW I make faux buttermilk from unsweetened almond milk and lemon juice and it works just as well as dairy, and use duck eggs since we keep them out here on the farm, making them a bit richer in taste as well. YUM. This is my favorite muffin recipe. The blueberries and cornbread combination works really well. Jenn, Absolutely love these muffins and have baked them several times. Sadly a family member has just been diagnosed with a serious health problem and will be needing surgery. It is essential that she follow a dairy-free diet. Can you help me with replacing the dairy in these muffins? Hi Heidi, I’m sorry that someone in your family is ill! I do think that you could prepare these with a non-dairy milk, like soy or almond milk, and a dairy-free butter substitute. I’d love to hear how it turns out with these changes. Thanks for your quick reply, Jenn. I did try making these muffins with almond milk and non-dairy butter. They turned out well. Not quite as good as your recipe, but better than giving them up. Thanks for so many great recipes. Would love if you could publish some non-dairy recipes in the future. That is what I will be looking for now. 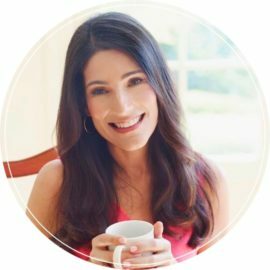 Heidi – I’d try almond milk with the lemon juice, and use olive oil rather than vegan butter as you’ll get better moisture that way (and more flavor than the mixed oils they use in most dairy-free butters). Made these this weekend and they were great! Hi Ann, It’s fine to add poppy seeds with no adjustments. Enjoy! These muffins are delicious. I substituted whole wheat pastry flour for the all purpose flour with excellent results. These are great with minor modifications. I cut the butter to one half stick and use a little bit more milk, use orange extract instead of vanilla, and1.5 cup blueberries because I can. I bake them at 375 to ensure that the cornmeal crisps. They come out perfectly every time. These are delicious! Instructions are perfect. Baking time was a few extra minutes to get the golden color. Flavorful and crispy! Thank you so much! Will be adding these to the lineup along with your other fabulous blueberry muffins. We have visitors coming from Canada tonight. I’d like to make these and wonder if the muffin liners be omitted if I use silicone muffin pan? Actually, it’s one of those Flexipans from France—a luxury gift! I’m also making your zucchini fritters. Just assembled the batter. Your recipes always impress company. Can’t wait to receive you cookbook — I think this week. Hi Renee, thanks for your nice words about the recipes and support for my cookbook! If you’re using a silicone pan, I think it will work to skip the muffin liners. Hope everyone enjoys! Absolutely delicious! Boyfriend brought the leftovers to work (so I wouldn’t eat all of them myself) and they got great reviews. The first time I made these I completely forgot the butter – right after I put those in the oven, I whipped up another batch with butter. Lo and behold, the ones without butter were nearly just as good as the ones with! The crumb was definitely nicer with butter, but only by a little. And I felt more justified smothering the ones without butter in, well, more butter. I’ll definitely be making them again, but next time I’m just going to forget about the butter. I think just the milk actually added enough fat to make them moist and delicious. I really like these muffins with less sugar and butter. I only used 1/4 cup sugar and 1/2 cup butter and increased the milk. This made the muffins just very slightly sweet with the help of the blueberries. I have never liked blueberry muffins. I tried this recipe because I bought a strange batch of blueberries that tasted fine, but had a mealy texture that my toddler didn’t like. So I thought I’d give this a go so the berries wouldn’t go to waste. I have to admit, I was not excited about these but they were very good. Not at all like a regular blueberry muffin – less sweet, texture more like cornbread, and I love the hint of lemon. My son is absolutely obsessed. He reaches and cries for these all throughout the day, I’ve never seen anything like it. I literally had to hide them out of sight so that he would stop asking for them. Safe to say, these were a hit! Thanks for another great recipe. These were excellent. I had real buttermilk so I used it. I only used 5 T of butter and a cup and a half of blueberries. I used Orange extract instead of vanilla. They came out perfectly. These are excellent. Nice change from regular corn muffins. They freeze well and then just a few seconds in the microwave. My husband proclaimed these were excellent. He didn’t even use butter which for him is unheard of. Thanks again Jen. You never let us down. Simple, straightforward and delicious. I love your recipes! Best blueberry muffins I have ever made, and I have been baking 50 years, (yikes!). Tender, delicious and addicting. Have made them three times in the past two weeks because everyone who tries them loves them and they disappear so quickly. 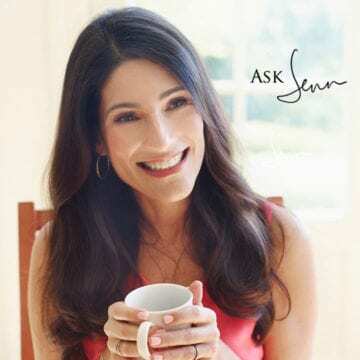 Hi Jen, looking at my review of these wonderful muffins and forgot to add that for the jumbo muffins I bake them for 30 minutes on the middle rack. They come out perfect! Excellent recipe – came out perfect in 28 minutes cooking time. The only addition I did was added some clear Sanding Sugar on top for that extra sparkle. Can you use frozen blueberries? Do you have to let them thaw before using? This are a family favorite. I freeze summer berries and make them all year long. Whole family loved them!! Great for a busy morning or after school snack, too! Hi Jen…hands down THE best blueberry muffins! The corn meal gives them such a lovely texture….I find most blueberry muffins are too cakey, these are perfect. I’ve been making them with frozen huckleberries we picked last summer. This recipe doubles really well, I make 12 large muffins, and reduced the sugar by one cup for a double recipe. Thanks so much for all your recipes, I love your website!! Can I substitute buttermilk for milk? Should any other adjustments be made? Can’t wait to try, they wound wonderful! Hi Alisa, It’s fine to use buttermilk; just omit the lemon juice as well. These are excellent. They’re moist and tender and not too sweet. I doubled the lemon zest and didn’t find it overpowering. One cup of blueberries is ample as noted in the recipe. The muffins don’t rise much so filling the cups very full as instructed is important. I used fresh blueberries that had been washed and air dried and they didn’t bleed into the batter as frozen ones tend to do. My muffins were done in 26 minutes. I used cast iron muffin pans without paper liners and didn’t have a problem removing the muffins. They’re light and fragile until they cool but came out of the pan easily once cooled. I want to make these gluten free. Can I just sub gluten free flour? Hi Toni, I haven’t made these with gluten-free flour, but I think it should work. I’d love to know how they turn out if you prepare them! A little disappointing for me. I was expecting a lot more taste. I followed the recipe exactly, but they were bland. I spend an enormous amount of time in the kitchen baking and cooking and these weren’t anything special. I served them still warm, but also had one after it completely cooled, sorry to say, very disappointed. Delicious! I made these one morning and they didn’t last too many mornings after the first. I had some buttermilk I wanted to use up, so just used that instead of the milk/lemon juice mixture, and they were still wonderful. Is this recipe in your book? It should be! It’s great, instructions, measurements, baking time all just right and it tastes wonderful. The lemon juice and zest is perfect. It’s not too sweet, too heavy, too hard to make or “too” anything. It’s just right! YUMMMMM. Hi Pam, so glad you liked the muffins! This recipe won’t be in my book (but you can always find it here :). Made these today. So nice and light. Not overly sweet. Just a lovely lemon taste with a few blueberries. Good suggestion not to overdo it with blueberries. Like the little crunch of the cornmeal. These are delicious. I made a double batch just to try them out 2 days ago, and my family has gobbled them up! Made these this afternoon and my husband and I love them. The lemon zest adds that little extra. Recipe is definitely a keeper. Thanks for sharing. what do you think about making mini muffins? Hi Cheryl, Yes, I think mini muffins would work. I’d bake them at the temp that the recipe specifies and start checking for doneness around 12-15 min. Hope you enjoy! Wonderful flavor and so easy to make. I will be making these often. Thank you! Just made the muffins and they turned out great. just like all your other recipes I’ve tried from your site. Always looking forward to your weekly emails. Most muffins are somehow disappointing – these were WONDERFUL. My only note is that it only made ten muffins for me. Thank you Jen! Perfect. I swear Chef Jenn you will make a baker out of me yet! These are very tasty, love the sweet blueberry with the savory cornbread! They looked just like yours, my husband was so excited to see I made something special. Thank you! Looks delicious!! I usually make large muffins.. What would be the bake time? Yes Sandu, these should freeze nicely! My hubbie has diabetes and I would love to make him these cute little bites of goodness! Can Splenda be used in place of sugar in this recipe? Hi Thalya, I’ve never baked/cooked with Splenda, so I can’t say for sure, but I think it’s likely to work. I’d love to hear how they turn out if you prepare them with Splenda! Could this recipe be made with more corn meal and less flour, for gluten free alternative? Hi Kate, I’m afraid without the flour that the muffins wouldn’t rise and would be very crumbly. You could always substitute the all purpose flour with a gluten-free variety.